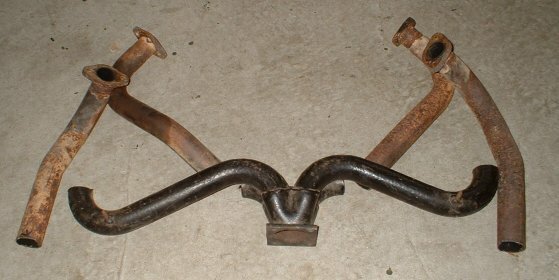 The left one came with the engine, the right one I bought additionally. The front two cylinders will go directly to the two cut-off pipes of the spaghetti exhaust. 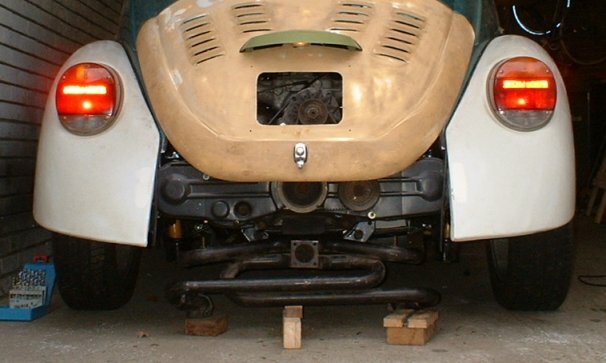 The two rear cylinders will go the the long pipes of the spaghetti exhaust. The pieces of the Alfa manifold will have to be cut up to make them reach the spaghetti exhaust. I might even have to cut up the other Alfa manifold too. It’s good to have nice neighbours… 🙂 It’s a nice alumium silencer with a very big diameter port on the intake side. 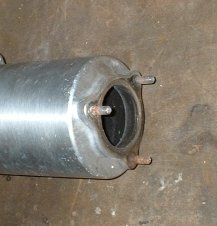 I will have to make a triangular plate to weld the exhaust pipe on to it. I want to hang it under the rear apron pointing to the left and a little downwards.